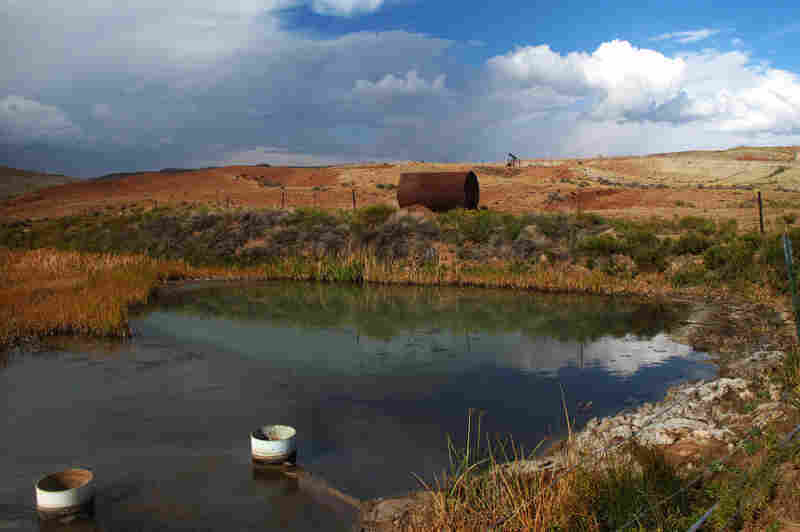 Loophole Lets Toxic Oil Water Flow Over Indian Land Every month, oil and gas operations dump millions of gallons of wastewater on the Wind River Reservation in Wyoming. Under a long-standing EPA loophole, it's perfectly legal. Internal agency documents obtained by NPR show the water contains toxic chemicals, including known carcinogens and radioactive materials, that end up in natural rivers. The EPA requires that the wastewater streams show no obvious sheen and no solid deposits. But both were visible near oil fields on the Wind River Reservation in Wyoming. The air reeks so strongly of rotten eggs that tribal leader Wes Martel hesitates to get out of the car at an oil field on the Wind River Reservation in Wyoming. He already has a headache from the fumes he smelled at another oil field. Martel is giving me a tour of one of a dozen oil and gas fields on the reservation. These operations have the federal government's permission to dump wastewater on the land — so much that it creates streams that flow into natural creeks and rivers. And this water contains toxic chemicals, including known carcinogens and radioactive material, according to documents obtained by NPR through Freedom of Information Act requests. The fumes hitting Martel's nose are hydrogen sulfide, which can be deadly. So Martel makes sure the wind is at his back before walking over to a pit the size of several tennis courts. 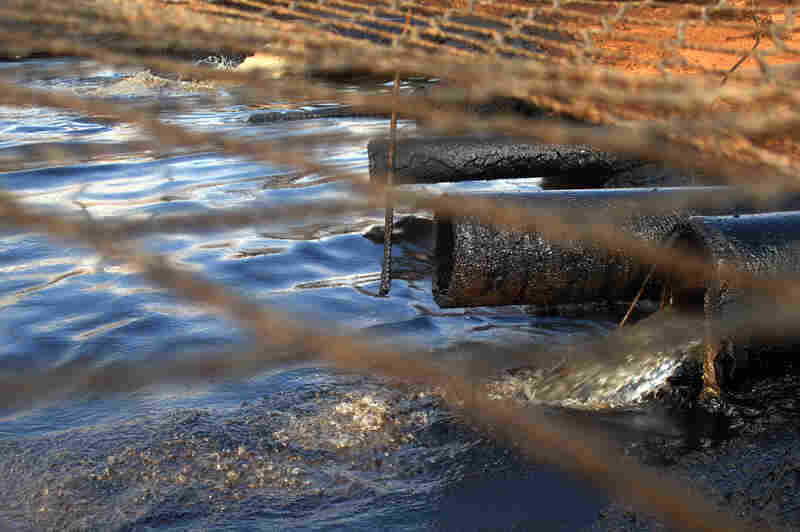 Pipes are emptying dirty brown water that came up from oil wells into the pit, which is completely covered in goopy black oil. The oil is supposed to float to the surface, and then a truck will vacuum it up. Any solid stuff should fall on the bottom of the pit, before the water rushes out and forms a stream. But there are still chemicals in the water — some from the earth, some from the oil, and some the companies add to make the oil flow faster. About a half-mile from the pit, Martel stops the car on a bridge over that stream of murky gray water. A shiny film covers the water in some places. "I wish a lot of people could see this," says Martel, the vice chairman of the Eastern Shoshone Business Council, the tribal government. "This is something that's going on in the reservation: This don't look too cool." In most of the country, this would be illegal. 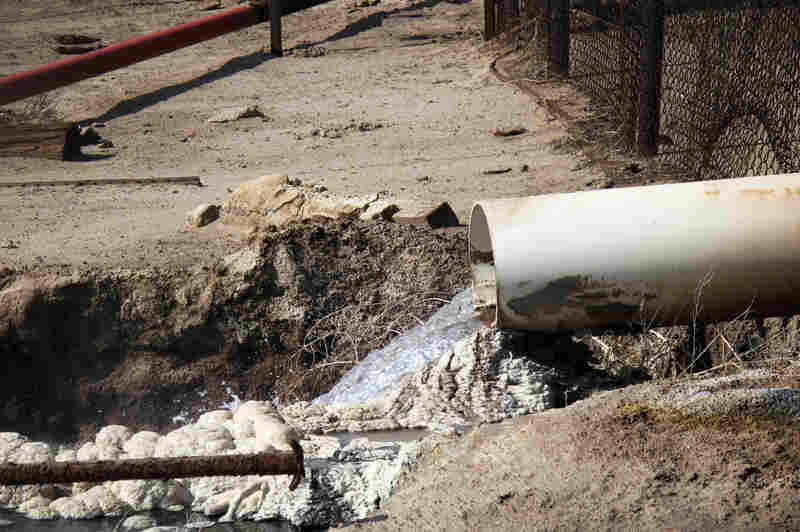 Most oil fields reinject wastewater far underground, where it cannot cause harm. So why is this wastewater being released into a desert wilderness of sagebrush-covered foothills and sandstone cliffs that blaze with reds and oranges? The few cows grazing nearby provide a clue. "You can see the tracks into the water here," says Martel. "This is one of their watering holes." Without the wastewater, this area would be bone dry most of the year. 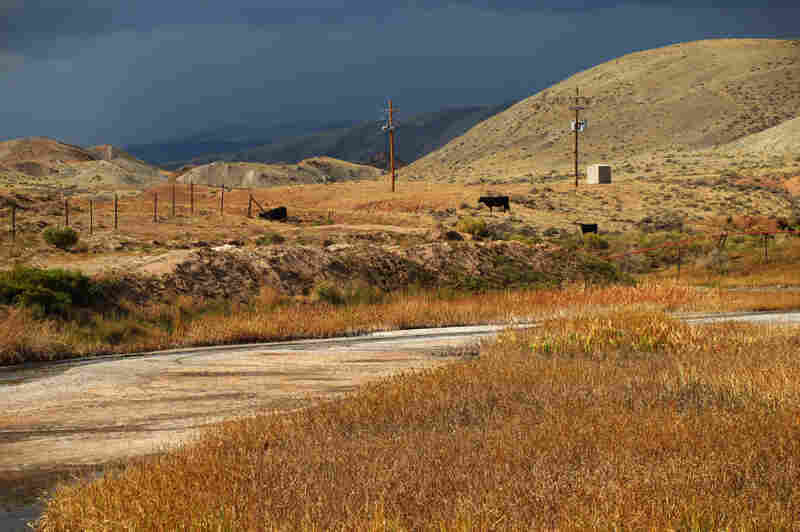 In the 1970s, when the Environmental Protection Agency was banning oil companies from dumping their wastewater, ranchers, especially in Wyoming, made a fuss. They argued that their livestock needs water, even dirty water. So the EPA made an exception, a loophole, for the arid West. If oil companies demonstrate that ranchers or wildlife use the water, the companies can release it. Off the reservation, Western states get to decide what oil companies must do with wastewater; over time, states' rules have become stricter than the EPA's. Some states have all but outlawed dumping. But on the Wind River Reservation, the EPA controls whether companies can release wastewater on a case-by-case basis. The EPA refused multiple requests for interviews, but in a statement, the agency said it was evaluating the permits it gives some of the companies to expel this water on the reservation. "EPA is reviewing new information associated with these permits and intends to meet with the Tribes in upcoming weeks to discuss next steps," the statement reads. The responses to NPR's two Freedom of Information Act requests include emails between staffers, correspondence with the companies, results of water-quality tests, the permits, and documents justifying each permit. Most of this information had not been public before. The documents show hints of mutiny inside the EPA. Some EPA staffers clearly are appalled by the wastewater releases. One wrote in an email to colleagues: "Can we get together and discuss a strategic approach for sending our message of concern? I have attached pictures of this ridiculousness." Another staffer warns that the chemicals in the water could have "irrevocable human health and environmental impacts." The documents also show recent detective work that some EPA staffers did to try to figure out what chemicals companies are putting in the water. 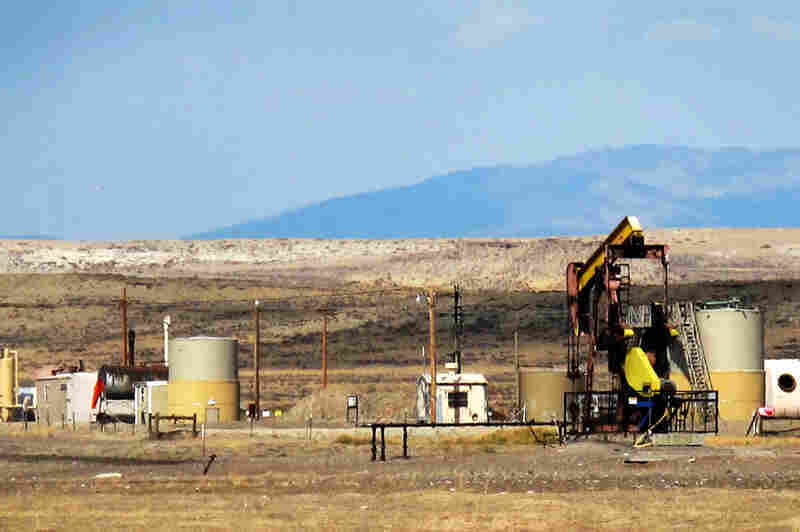 Their research reveals that some of the waste streams sometimes include chemicals from hydraulic fracturing, an engineering technique designed to increase the flow of wells. They also include chemicals whose warning labels clearly state "toxic to aquatic organisms," "prevent material from entering sewers or waterways," and warnings about cancer and birth defects at low levels. The documents suggest that at least some people inside the EPA are advocating for stricter rules. But much of this debate has been kept secret. The EPA refused to give NPR 757 documents about the loophole, claiming they can be kept secret because they are between the EPA and its attorneys or among EPA staffers. Experts, including scientists at the U.S. Geological Survey, say it's very rare for oil field water to be released into drainages or streams because it nearly always contains harmful chemicals. "It's a very uncommon situation in the United States and, I believe, most of the rest of the world," said John Veil, a retired wastewater expert at the Department of Energy's Argonne National Laboratory, who now works as a consultant. In one analysis that Veil did for Argonne, he found that 98 percent of the water that companies pump up with oil is reinjected deep underground. Veil says it's usually far too salty to discharge. Some scientists were alarmed when they learned about the oil field wastewater releases, especially given that it is happening on tribal land. "I was shocked when I heard this," says Rob Jackson, a Duke University environmental scientist. "I was very surprised this was allowed. It's just something that we should know better by now. We should know that dumping our waste onto the surface of the ground is a bad solution." Other experts agreed that the chemicals in the water raise concerns. However, some scientists, including staffers from the U.S. Geological Survey, felt uncomfortable commenting for the record without doing their own testing. Jackson reviewed many of the EPA documents released to NPR, including analyses of the chemicals in the wastewater streams and warning labels for some of the chemical treatments that companies add to the wells. He stresses that they include hazardous air pollutants such as hydrochloric acid and naphthalene, and carcinogens like benzene and ethyl benzene. "There are many things in this water that you don't want in the environment or in people's drinking water. You don't need to be a genius to know this is a bad idea," Jackson says. He urges the EPA to consider the consequences of its policy and how it looks. "Are we doing something on tribal lands we wouldn't allow somewhere else? I think that's something we have to be asking ourselves." Outside the reservation, Western states decide how oil field waste is handled — and their rules are stricter than the EPA's. For instance, off the reservation, the state of Wyoming requires companies to inject wastewater deep underground and out of harm's way if they've added toxic chemicals to the wells. Other states have set tougher water quality standards that have nearly eliminated these releases. On the Wind River Reservation, these oil field wastewater streams have flowed for several decades without attracting much interest, even from the tribes, according to Wes Martel and other officials of the two tribes that share the reservation, the Eastern Shoshoni and Northern Arapaho. "Most of our elders were very trusting, very trusting people. They were glad they had the opportunity to get some revenue. Most of them were just thinking, 'We're being watched over, and things are being taken care of,' " says Martel, 65, who was in tribal government many years ago and was elected two years ago to return to government. But in 2005, the Wind River Environmental Quality Commission sampled the water downstream of some of the oil fields. Researchers found toxic levels of some chemicals, stretches of streams that were lifeless, and streambeds splotched with black ooze, white crystals and purple growths. They recorded water temperatures as high as 125 degrees, and found dead ducklings, according to a draft report prepared by the tribes' environmental department. During tours of four of the oil fields earlier this fall, I witnessed visible violations of the plain language of the permits that the EPA gave these companies to discharge wastewater. 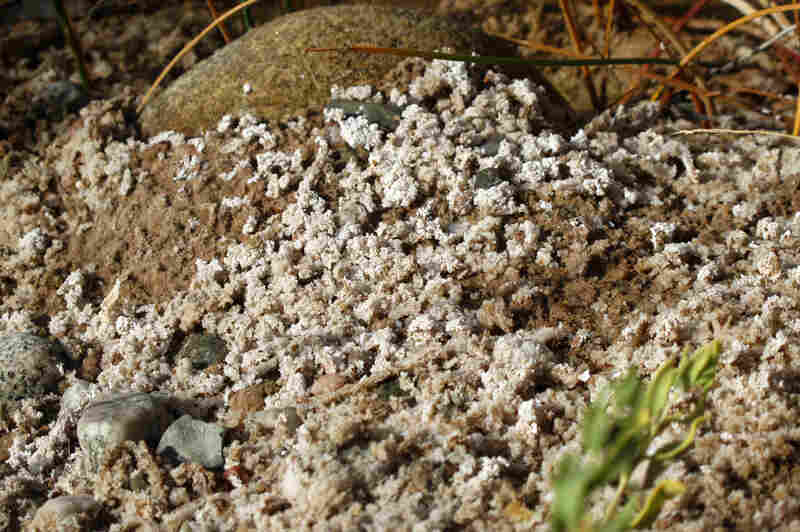 For instance, I saw streambeds covered in white crystals and rock-like formations below outfall pipes. The permits prohibit visible deposits in the receiving waters or shoreline. They also prohibit any visible foam or sheen — I saw both. At the wastewater discharge site at one oil field, company officials warned us to leave after a few minutes because of the danger of respiratory distress or death from hydrogen sulfide fumes. The companies were reluctant to talk. One agreed to meet at its oil field on the reservation but backed out the night before. Others failed to return multiple phone calls. Houston-based Marathon Oil Corporation, which runs three oil fields on the reservation, agreed to an interview but refused to be recorded. "As far as I know, there has never been concerns and opposition for the quality of the water that I'm aware about," says Bob Whisonant, Rocky Mountain operations manager for Marathon Oil, which has three oil fields on the reservation. Whisonant stresses that the water from his oil fields meets EPA's requirements. "We're really fortunate within Wyoming that the water is extremely fresh, very suitable for livestock and agriculture purposes. That's why we're able to discharge," Whisonant says. But the EPA's permits, which are reissued every several years, tell a different story. Even the state of Wyoming, which is known to be pro-industry, questioned the fact that the EPA's requirements didn't seem to protect aquatic life. The EPA's response was that the tribes had not adopted their own water quality standards. The EPA permits acknowledge that oil field water may not meet the agency's own water quality criteria. The agency requires only minimal water testing at most of the oil fields, and it does not do its own testing to verify the companies' claims; nor does it sample water quality in the streams receiving the wastewater. In 2007, the EPA required one company to test aquatic animals to see if they'd die in the water flowing from one oil field — it's a standard test of water quality known as whole effluent toxicity. The minnows and bugs in the sample died within an hour. The EPA asked the company to figure out what was killing the animals and propose remedies, but it let the company go on releasing the water for years. Five years later, the company, Marathon, says it is waiting for the EPA to OK a plan to lower high levels of sulfide in the water. Wes Martel says he's been pushing the EPA to thoroughly study the wastewater and then require the companies to purify it or inject it underground. He worries about water quality and wildlife — and about food safety, too. Oil field water abounds on the reservation, and the cows that graze there will eventually end up on dinner plates. "So it really makes you wonder: What impacts is this having on not only aquatic life, but our wildlife?" Martel says. "You've got to wonder, what types of chemicals are those beef retaining? And when that goes to the slaughterhouse, what's in your steak?" 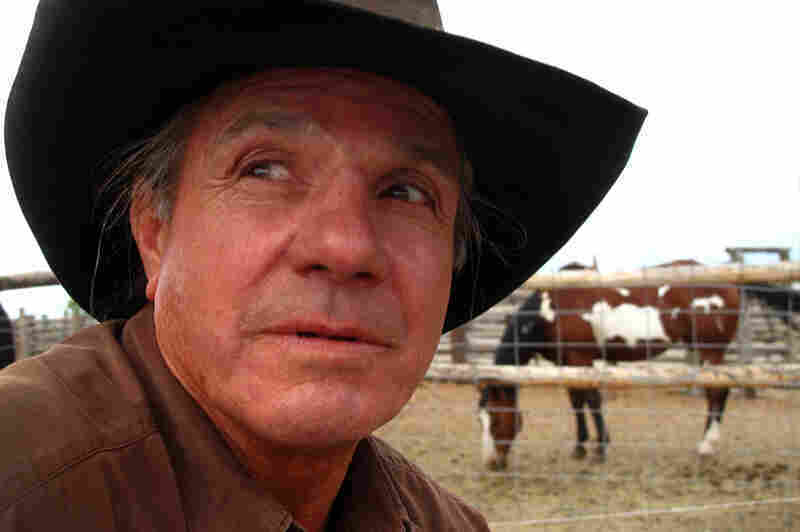 But Eastern Shoshone member Darwin Griebel, one of a handful of ranchers whose livestock use the oil field water, pooh-poohs Martel's concerns. "Animals drink it. People aren't going to drink it. Hell with the quality of the water," says Griebel. Griebel has known Martel for nearly 60 years, since they were in elementary school and slept over at each others' houses. But he says they don't agree on this issue. What's most concerning to Griebel is that the water has been crucial to his family's business for generations. Without it, he says: "There would be no water for the cows. There would be no water for the deer, the antelope. Nothing. It would put us out of business is what it would do." 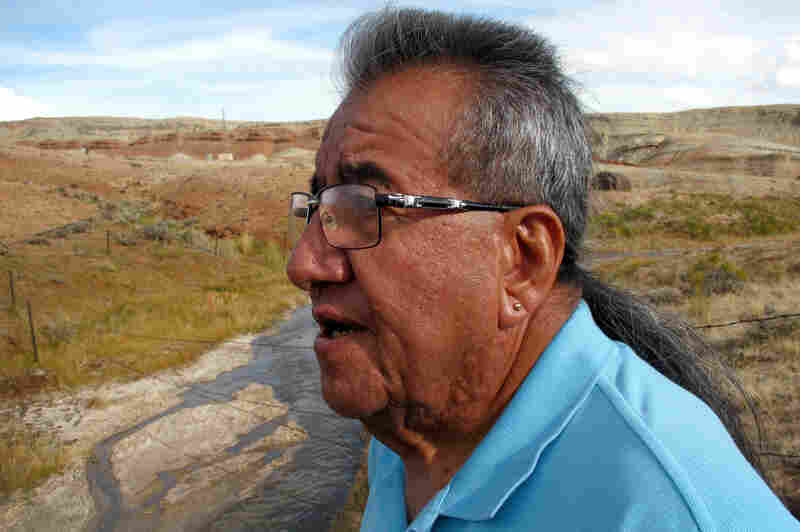 But Martel says that if the EPA does not put a stop to this, the tribes will step in. If the oil companies say that reinjecting or cleaning the water would be so expensive that it would no longer be profitable to pump oil, Martel knows what his response will be: "Good riddance." "We'll take it over ourselves and do it right," he says. Martel dreams of putting tribal companies in charge of their oil fields. Then the tribes would get all the profits, instead of just the royalties the companies pay them. They'd also be able to protect water quality for future generations.